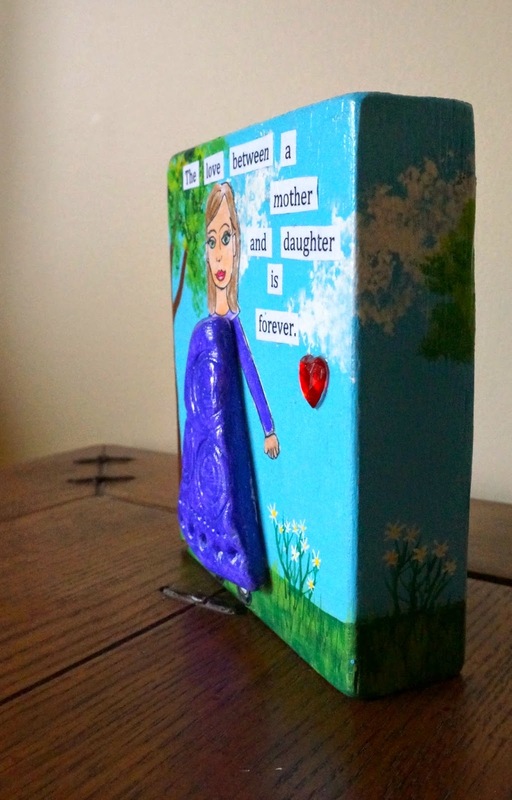 In my current residency I have been working on these mixed media blocks for Mother's Day. We used Model Magic to add a nice 3D element to them. On my sample I wrapped the painting around the sides and back. At school we only had time for the sides. Here is some student work. - Model Magic, I buy white and in the large bin. (use your Michael's 40% off coupon). One bin (4pkgs) was more than enough for 2 classes. I handed out the wood blocks so the kids could figure out the right size to make the clothing. Each student got a plum sized piece of Model Magic. We pressed them flat on a piece of wax paper. I also gave each student a napkin with their name on it. Using a plastic knife they cut out the clothing. Using some assorted tools we added texture to the Model Magic. Those green tools are from the Dollar Store. I bought several sets of them. They are for decorating cupcakes but work great as tools for clay. 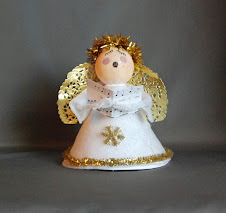 Place on napkin/paper towel and set aside to dry. About 24hrs. While the Model Magic is drying you can paint the block. Make sure to do the sides and top for a nice finished look. I gave the kids a few ideas, a nature scene like my sample. Or whatever scene they wished. We painted the Model Magic after it set. It's still fragile at this point so i asked the kids to be careful. Once it's mounted on the block and seal with podge it's firms up and is more durable. I gave each student a piece of paper and they sketch out the head, arms, and feet of their moms. We added some outlining and colour and cut our body parts out. We glued everything into place with some tacky glue. We added a small heart gem and sealed them with some Mod Podge. That's it, a great Mother's day gift that will be treasured. 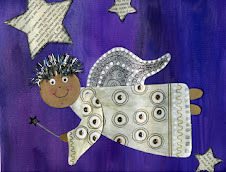 This is a project I have been doing with Grades 1/2. It relates to Calgary's history but can be adapted to whatever historical landmarks are in your area. It's an 8"x10" canvas. 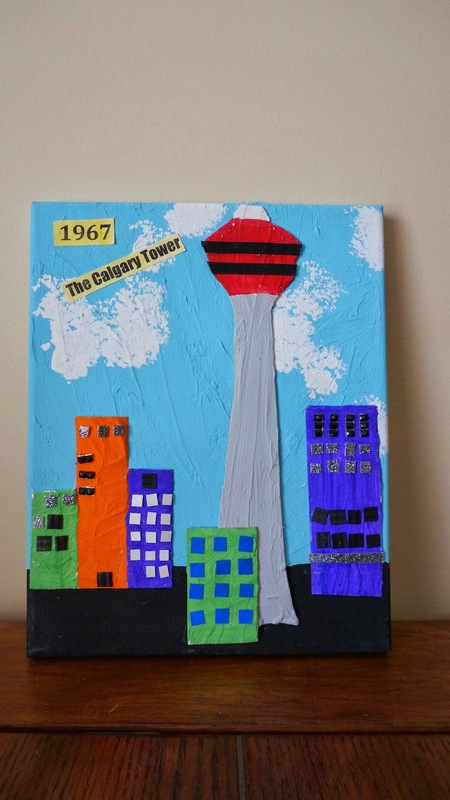 This one is for the opening of the Calgary tower in 1967. This one is for the establishment of Fort Calgary in 1875. I give the students a choice for which one they want to complete. 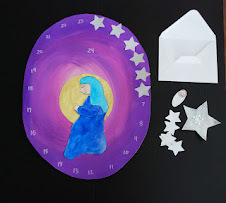 Cut pieces for your project out of recycled cardboard. 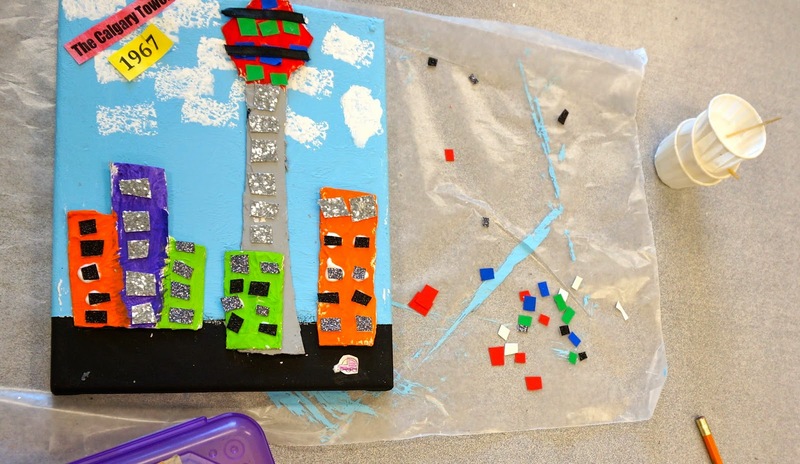 For the Calgary Tower we cut out the tower and some additional skyscrapers to represent downtown. For Fort Calgary we cut out a Tipi, the main fort building, and the 2 towers. The kids wrote their names on every single piece on the coloured side with a sharpie. We turned them to the brown side and gave each piece a coat of drywall filler. The kids just use 2 or 3 fingers to spread on the drywall. We don't put it on the coloured side because it has a shiny finish that the drywall doesn't stick to after it has setup. I also had them add some drywall filler to the canvas to texture the sky a bit. Set aside to dry overnight. After the drywall has dried it's time to start painting. I tape off the horizon line for the kids. This gives the kids a visual on where to stop painting. Calgary Tower is portrait style, Fort Calgary is landscape. We paint the sky blue for both the Calgary Tower and Fort Calgary. While the canvas is drying paint the parts and pieces. Don't worry about the details just the background colours. When the canvas is dry I lift the tape and move it up so the edge is right at the end of the blue sky. For the Calgary Tower we paint the bottom black. For Fort Calgary we paint it green. Remove the tape when the ground area is dry. Using a sponge we sponged on some clouds. I find that if you moisten the sponge first you get a better result. You just want it damp. When your parts and pieces are dry start adding details. I used black ribbon for the tower and red ribbon for the trim on Fort Calgary. We also used coloured paper and some glitter paper for our skyscraper windows. Glue the pieces onto the canvas. For Fort Calgary we add designs to the Tipi with coloured paper and ribbon, glue on windows and trim, and add a flagpole with a Union Jack we make out of paper and sharpies. We also add some cut twigs to form the outer wall of the fort. Finally add the titles. I printed these off the computer, added a little colour with some disk tempera paint like a wash, and had the kids cut them out. 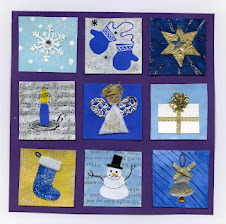 You can add a coat of Mod Podge to seal everything into place and give the piece a nice shiny finish.